I can’t believe the blog is 4! Sometimes is seems like only yesterday… haha but really, time is going by so fast. For those of you who have been with me since the beginning, you know the.B.Law started off as Tragic Girls with my old roomie/best friend/sorority sister/style panelist Heather and I living together and tracking our tragic stories. 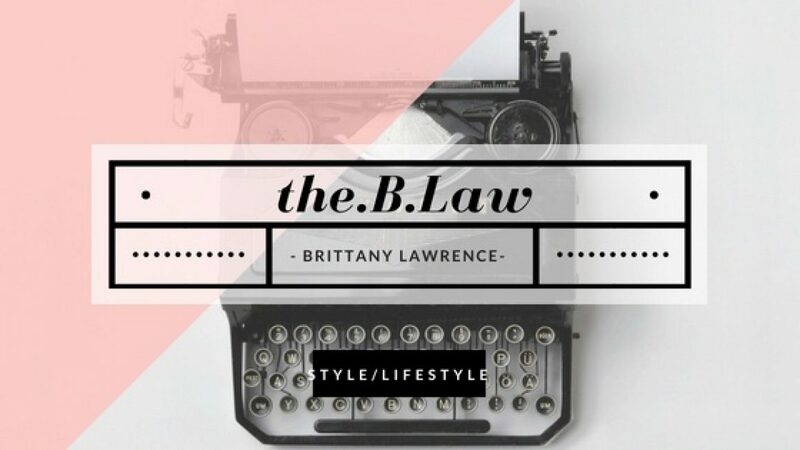 A year and a half later I changed the name to the.B.Law to start the change in direction of the blog. Although I loved tragic girls, and yes we are both still tragic… very much so, but my passion is style. I blame it on working in retail for almost 8 years, but it is really something I want to do with my life, and I want to write and actually use my college degree. So why not combine them and write about style? I know the style blogger community is highly saturated, but I believe everyone has something unique to bring to the table. No two people are alike just like no two people’s sense of styles are alike. For example I have a lot of style ideas in common with both Heather and one of my other best friends, Cher (style panelist), but Heather and Cher both have completely different styles than each other. I love getting inspiration from all of my friends, models, movies and TV shows, strangers, and other style bloggers, and turning it into something of my own. Style to me is the best way to express myself. It is literally all up in your face and you can really read someone by what they are wearing. You can tell if I am feeling confident, lazy, bold, safe, and so much more. I have also said this before but I LOVE they way a good outfit makes you feel. When you are super excited about a look and you know you look good in it, it is like an adrenaline rush. You end up with a completely different sense of confidence that can last all day. I really feel like this is a good year for the.B.Law. Last year had some good growth and I learned a lot and I got to try quite a few more collaborations, but this year I know it is going to get even better and bigger. Just in time for my 4 year blogaversary, I hit one of my blog goals… I got accepted to rewardStyle!! I would talk about it all the time that I just want to be cool and be on LIKEtoKNOW.it. I gave it a try and applied and got denied, as expected. I grew some more and tried again, and again denied. You can bet I wasn’t giving up though! I applied last Thursday just for the heck of it because I was impatient to wait any longer and Friday I got an email THAT I WAS ACCEPTED! I was so excited I danced around my office at work and told my three coworkers AND THEY DON’T EVEN KNOW WHAT IT IS! I literally went downstairs just to tell one of the receptionists about it because I knew she knew LIKEtoKNOW.it and would be excited with me LOL (You always got my back!). Anyways, AHHHHH! I am literally so excited, I feel so legit now! Next goal, get to “swipe up” on my stories, I will get there! There will be so much more style coming to the blog and I am so excited. There will be another change though. My focus for the last year and a half has been office style and how to keep your personal style at work. Although that will still be very present as I work in an office, that will not be my main focus. I have felt myself evolving more and more away from that and I want to see where that takes me. A couple years ago I did this online blogger class and she really stressed to start off with a specific niche before being so broad. It was 100% true. I got way more traction and followers by being a sort of “expert” in my niche, and then eventually you will grow out of it. I think my growing has begun. Now I will need to create a new graphic for my blog so look for that change too! I have multiple outfits that I love for going on dates, but I really love dressing for lunch dates. One of my current favorite looks for a lunch date includes this red off the shoulder top I bought from Nectar Clothing (current alternative linked) in the Claremont Village. It is perfect for lunch because you can dress it up or down. Here I paired it with white shorts from Old Navy, and my indigo rd. wedges from Macy’s. Another option could be brown sandals in case you don’t want to look too overdressed. This top could also be paired with blue jean shorts, regular pants, boyfriend jeans, or even white jeans. If you are doing normal blue jeans, you can also try pairing the top with white sandals. I have worn this top with boyfriend jeans, and my wedges out to a dinner date with a friend and it was so perfect for the occasion! Even though this specific top is from last year, this simple look can be easily recreated with most off the shoulder tops, especially since they are still very popular this year. Aside from it being a great date outfit, it is a great spring and summer outfit in general whether on a date, out with the girls, or at a family gathering!